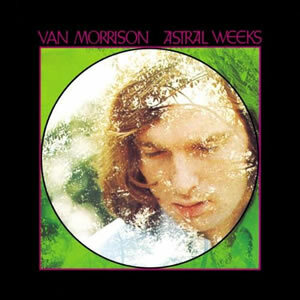 Astral Weeks was the second solo album by Van Morrison, and in a lot of ways it was his own, direct counter-reaction to the debut album which was released in 1967 without Morrison’s consent and filled with weak studio outtakes. With a blending of folk, blues, jazz, and classical music, Astral Weeks was a complete departure from anything Morrison had done previously and the impressionistic, stream-of-consciousness nature of the music has received critical acclaim for four and a half decades and counting. Amazingly, most of the recording of the eight album songs was done in just two sessions and done among musicians who had never played together before. Van Morrison got his start with the group Them, which had a handful singles in the mid 1960s. After an American tour in 1966, the band members became involved in a dispute with their manager over revenues, which ultimately led to the band’s break up. Convinced to record solo by producer Bert Berns, Morrison recorded eight songs in 1967, which were originally intended to be used as ‘A’ and ‘B’ sides of four singles. Instead, these songs were compiled and released as Morrison’s debut album Blowin’ Your Mind! without the singer even being consulted. Although the song “Brown Eyed Girl” did reach the Top 10 in the US, Morrison was dissatisfied with the album and sought out a new recording contract. Morrison moved to Boston where he started to perform in an acoustic duo with double bassist and Berklee student Tom Kielbania. Soon, they began to develop the basic material for Astral Weeks. Producer Lewis Merenstein Went to see Morrison’s live act and was moved by his unique sound. Merenstein had a background in jazz, and decided to replace Kielbania with veteran bassist Richard Davis, who served as the session leader among the unfamiliar musicians. By all accounts, the sessions lacked basic formalities, with Morrison playing the songs on acoustic guitar and letting the session musicians play exactly what they felt. All eight songs were composed by Morrison and each original album side was subtitle, with side one called “In The Beginning”. The opening title song is one of the strongest on the album. A pure ballad of romanticism which gradually builds on its acoustic and double bass core, adding intensity throughout while not really changing chord structure and the long string-intensive fade out really drives home the central theme of “…to be born again in another time, in another place…” Morrison described it as “transforming energy, or going from one source to another with it being born again like a rebirth”. The first side ends with “Cyprus Avenue”, a great and romantically intense song with a core blues arrangement and topical Celtic/folk instrumentation. Fallon’s ever-present harpsichord and later fiddle makes the song a lot looser and more striking as it progresses. A long fade maintains (if not escalates) the intensity of this song, named after a wealthy street in Morrison’s hometown of Belfast. Side two of Astral Weeks is subtitled “Afterwards” and begins with the most jazzy track on the album, “The Way Young Lovers Do”. With a just a splash of Mexican horns, this definite sixties swing song is a very rewarding listen in spite of being one of the shorter songs on the album. A great fiddle adds real flavor to the subdued acoustic tune, “Madame George”, which is otherwise driven by Morrison’s voice and never really leaves the exact chord progression over its nearly ten minute duration. Driven by vibraphone, “Ballerina” is still intense and romantic on its own, with nice sustained horn accents. The song is the only one composed while Morrison was still a member of Them in 1966. Unfortunately, the album seems to run out of steam by the time it reaches the closer “Slim Slow Slider”, which is little more than a showcase for the saxophone of John Payne. Despite the fact that it failed to achieve significant sales success and reached gold status 33 years after its release, Astral Weeks remains a cult favorite. Morrison would soon achieve his commercial breakthrough with his third solo album, Moondance, released in early 1970.